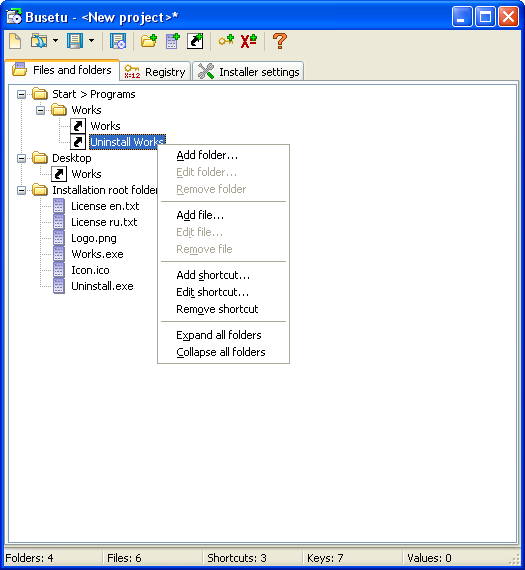 Program for building installers (installation applications). 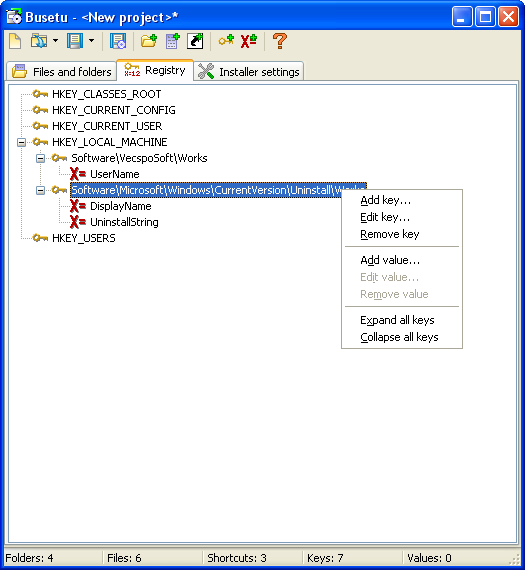 Installer can create folders, files, shortcuts, registry entries. By using BuSetu you can easily create installation programs, which will install any of your program (or something else) on user's computer. Building of an installer consists from three steps: addition of folders, files and shortcuts, creation of registry entries, setting up an installer. Resulting installer is a single executable file, so there is no need in additional files or libraries. BuSetu's package includes small uninstaller, which can be used to correctly uninstall programs. BuSetu is the multilanguage application: BuSetu itself, it's installer and uninstaller automatically switches to language of user operation system. If this language is not supported by the program, the english language will be used. While building an installer You can specify shortcuts names and it's objects in various languages, needed language will be selected by installer. Start building of true multilanguage installers, start to use BuSetu! BuSetu is free to use and demands no registration. Хорошую программу создали! Я тут создам любой установщик шаблонов! Не хватает возможности помещать файлы устанавливаемой программы в разные папки !! !